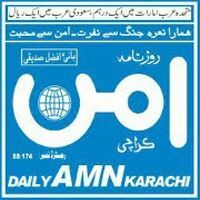 Daily Amn is a daily urdu newspaper publishing from Karachi. The newspaper covers all Latest news, Breaking news, pakistan news and international news. It is popular ABC urdu newspaper. Daily Aman is an Urdu Language Daily Newspaper. Daily Amn is one of The Largest circulated Newspaper of Pakistan. At The Website You Will Find not only Karachi news but also news from all over Pakistan.